Golf season is in full swing, and we love to see the course busy with carts and golfers enjoying the beautiful summer weather. The grass is green and the landscape is in full bloom, which makes for a picturesque setting to play a game of golf. Are you finding your game isn’t quite living up to the setting? Our director of golf and interim general manager Todd Hutcherson shares some tips to help take a few strokes off your game. Many golfers think of hitting the driving range when they want to practice. After all, it’s fun to impress your friends with a long drive off the tee. But if you really want to improve your score, work on the short game. An average of 65 percent of shots are taken within 120 yards or less of the hole. Put a little time into practicing your putting and chipping, making use of those irons rather than your driver. You’ll start to turn three or four bogeys into pars, or double bogeys into bogeys, taking a few shots off your final score. No one wants to land in the rough, but sometimes it happens. This time of year, with the grass thick and high, the rough is an even bigger obstacle to overcome. But don’t despair if your shot doesn’t hit the fairway. First, choke down on the club a little, to get more control and make it easier to control through impact. Use a more lofted club to get the ball up in the air. And hit the ball first, to maximize the distance you get out of the shot. Most importantly, don’t try to make up all the yards on this one shot. If you’ve hit into the rough, take your medicine and concentrate on getting the ball back in the fairway. This gives you a larger margin for error and helps shrink the odds of making more shots than necessary on this hole. A greenside bunker shot is easier than most golfers think. First, in this case you want to hit the sand first. To make that happen, move the ball two to three inches forward of center, and then dig your feet into the sand. This makes our club enter the sand behind the ball. Plan on your sand shot going about a third of the distance the same swing would go as a pitch. And most importantly, only change your set-up, not your swing. The side hill lie is a challenging set-up, and it happens quite frequently on our NC mountain golf course at High Meadows. To get the best shot and get you on the green, you’ll want to aim toward the high part of the hill, as your ball will always favor the opposite direction. 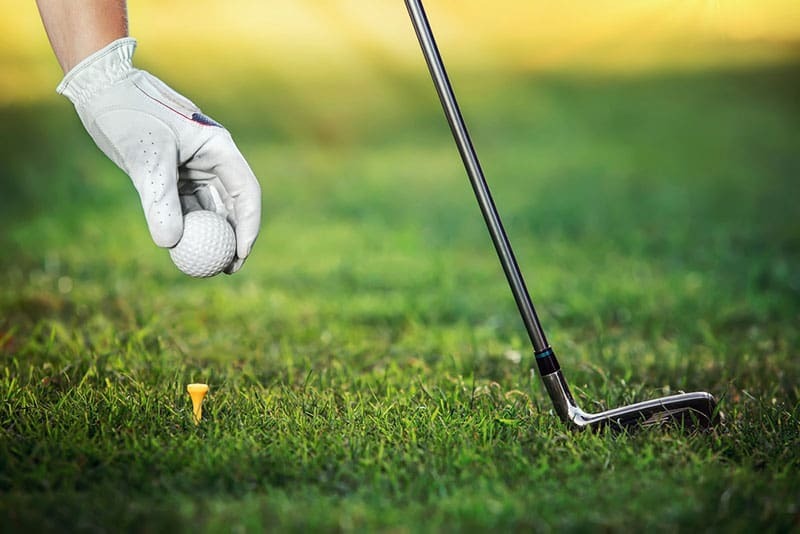 Be sure to take a few practice swings, paying attention to where the club sweeps the grass, to determine the appropriate ball position for the lie. If the ball is above your feet, choke up on the club. If it’s below your feet, bend your knees and stay there. Any move up will result in a thin, missed shot. A common mistake golfers often make is spending too much time focusing on their swing mechanics during a round of golf. While this is important to improving your game, it should be done on the range, not out on the course. Take a few warm-up shots, and just come to terms with whatever swing you have that day. Tinkering not only makes you lose sight of the overall objective, which is to play golf, it also tends to make swing mechanics get worse. Remember, your main task is to find your target on each shot and shoot the lowest score possible for that day, no matter what swing you may have. Thanks for mentioning how you should remember to work on your short game when playing golf. It is important to understand that doing some research can help you find the best way to get the type of game you want. A friend of mine was talking about how they needed to start playing golf, so I wanted to help him out. My son and I are learning golf together, so thanks for sharing this. I like your point about using a more lofted club if you have trouble getting the ball in the air. I’ll have to find the right club for us that’s easy to use for beginners.